There is great diversity to Europe’s tax systems, reflecting the choices of sovereign States with differentiated destinies. Since the Treaty of Rome, the Member States have steadily refused to give up national authority over taxation, with the exception of a minimum level of coordination on value-added tax (VAT). Europe now faces a real risk of a rise in non-cooperative tax strategies, with each country seeking to improve its economic performance at the expense of the others. This kind of aggressive strategy is being fuelled by two factors: on the one hand, a drive for competitiveness (fiscal devaluation), aimed at reducing the tax burden on businesses so as to improve price competitiveness; and on the other, a drive for fiscal advantage, aimed at luring the rarest factors of production to the national territory. On a macroeconomic level, it is difficult to distinguish clearly between these two factors. 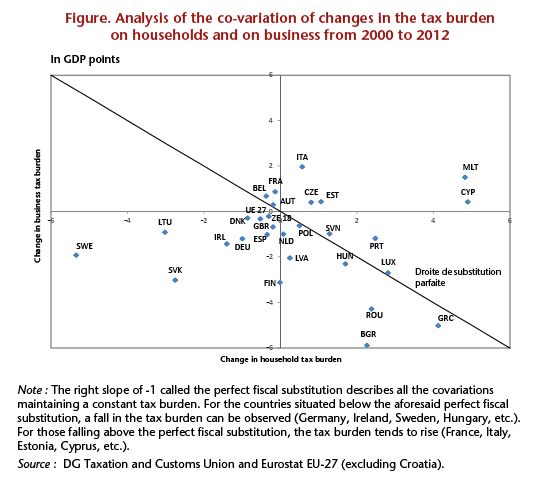 However, one way of understanding how the European states have improved their position may be to look at how the tax burden on business has evolved in comparison with the burden on households. OFCE Note no. 44 describes changes in the compulsory tax burden (TPO) in Europe. It is based on statistics from Tendances de la fiscalité, which is published jointly by Eurostat and the European Commission’s Taxation and Customs Union Directorate. These statistics have the advantage of providing harmonized data on tax rates, with a breakdown of the tax base (capital, labour, consumption) and the type of paying agent (household, business, individual entrepreneur). We study the period 2000-2012: it is of course always difficult to separate trends in taxation from cyclical adjustments, especially as budget constraints tighten. Nevertheless, the 2000-2012 period should be sufficiently long to reveal changes of a structural nature. Based on these data, we first highlight contrasting trends in the tax burden in the European Union, which can be broken down into four phases: two phases of rises (between 2004 and 2006 and since 2010) and two phases of reductions (before 2004 and from 2006 to 2010), which is linked in particular with cyclical factors. 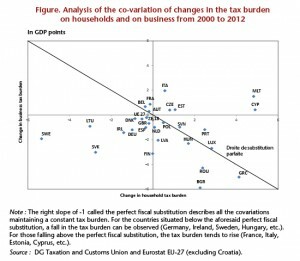 In addition to this common dynamic, we can see non-convergent adjustments made by the European countries in the taxation of households and the taxation of business (see graph). We then focus on possible tax substitutions between payroll taxes and consumption, and between payroll taxes and employee contributions. Over the period 2000-2012, it is difficult to talk about tax competition at a global level, even though there was a slight decrease in the average tax burden within the European Union and very specific moves in this direction by certain countries. While some countries have definitely reduced the tax burden on business (UK, Spain, Germany, Ireland, Sweden, etc. ), others have increased it (Belgium, France, Italy, etc.). However, in the long-term, it would seem difficult to maintain such a high level of tax diversity. At a time when European integration is being intensified, greater tax harmonization seems more necessary than ever.